It’s all in the name: All4Hair offers really everything for hair! 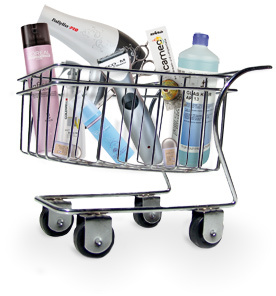 Professional hair dressers need professional products – whether hair care, styling, equipment or furniture is concerned. All4Hair offers hair dresser wholesale items from popular manufacturers. Permanent colour, hair care and styling product lines by Wella Professionals, L’Oréal Professionnel, Schwarzkopf Professional, Goldwell and many others, hair brushes & combs by different manufacturers, professional scissors and hair trimmers, equipment such as straighteners & hair dryers, as well as all furnishing a professional hairdresser needs for his salon. See for yourself and test All4Hair’s competence concerning hairdresser supplies and hair care. Subscribe to our All4Hair-Newsletter and receive access to exclusive online offers. We appreciate your subscription. Subscribe to the fortnightly All4Hair-Newsletter.